Define the competency requirements for each job role in terms of the skills and proficiencies that are required for high performance. Assess employees’ comfort level with the skills and proficiencies identified. Analyze the results, comparing and identifying the differences. Overages represent areas of strength, and shortfalls represent gaps and areas for improvement. However, to ensure a competency management plan is effective and contributes to overall operational success, you must have a good understanding of the Return on Effort (ROE). The ROE for implementing competency management should be carefully considered before starting the project. In particular, senior management and key stakeholders must understand that the full benefits of competency management will most likely not be evident for several months. 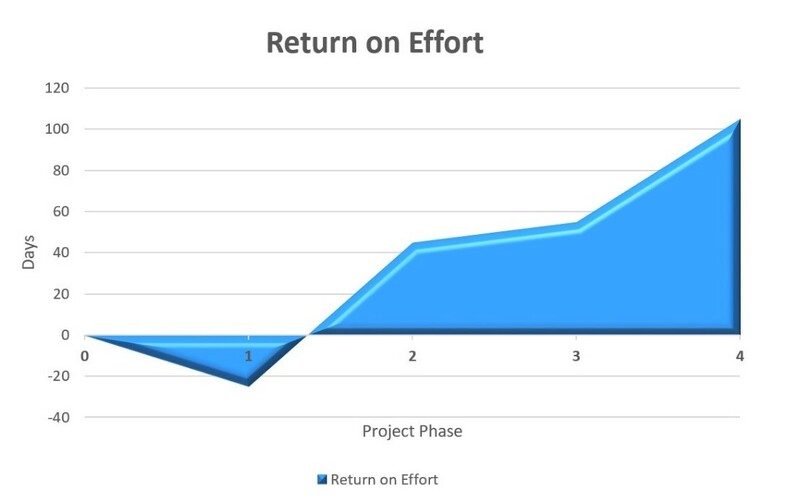 The graph shown here illustrates the typical experience for the ROE as the organization creates its learning curve for competency management. The time and financial investment in Phase 1 is a necessary and foundational prerequisite, but is likely to consume resources with less apparent or obvious outputs. Phases 2 and 4 are of particular importance because they produce a variety of outputs and benefits to the organization, many of which will build upon each other as time progresses. Phase 3 is similar to Phase 1, where the development of competencies and content requires time, construction, careful thought, and validation before any benefits become apparent. Some organizations have found this graph daunting and discouraging. For whatever reasons, they may have decided that the full effort is too long, too complicated, too costly, or too time-consuming. In lieu of developing competencies for every job role, they opted for creating a “snapshot” of competencies that are required for the majority of employees. In these cases, the project may require less programming and integration with legacy systems. However, companies that embed competencies into the annual development planning process are more highly motivated to integrate the competency system with the HR system(s), and therefore are more likely to reap long-term benefits from the effort put forth to develop the competencies and content. For best results and more convenience and accuracy, you may also consider procuring software tools such as WebMentor Skills™ to help your company identify, analyze, and manage skills gaps within your workforce. Before embarking on the process of creating a competency management method, not only should you understand the return on effort, you should also understand the 8 Success Factors for successful implementation and the likelihood that your company and key stakeholders are willing and able to adhere to them. Remember, competency management is not an exact science; it will work best if it is customized to your company’s goals and culture and if employees at all levels are fully committed to using it over the long term. If so, you should feel confident your organization will reap the rewards and long-term benefits.